The Washington Post has published an in-depth story on Project Talent. The story profile’s Project Talent’s origins and it’s potential to become the most important resource for research on Alzheimer’s disease and related dementias. We believe this remarkable study deserves national attention and this is a big step towards achieving that. The story will be published in the print version of the paper in the coming days. From the article: An estimated 5.7 million Americans have Alzheimer’s, and in the absence of scientific breakthroughs to curb the disease, the Alzheimer’s Association projects that number could reach 14 million by 2050, with the cost of care topping $1 trillion per year. 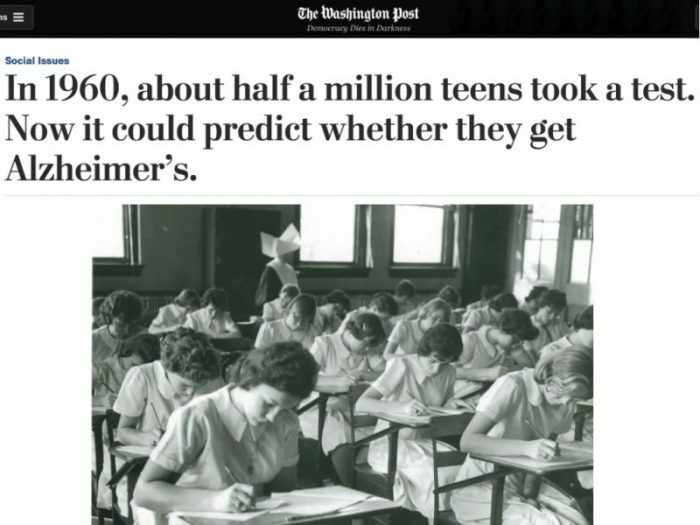 Read the full story here: In 1960, about half a million teens took a test. Now it could predict whether they get Alzheimer’s.